At the 2015 Frankfurt Motor Show, Mercedes took the curtains off its most awaited Mercedes-Benz C63 AMG Coupe 2017. The powerful model is anticipated to take the CLC and C-Class Coupe legacy a step ahead. Maybe this is why, on one side the housed V8 doesn’t compromises with the average and on other the distinct design makes it more adorable. 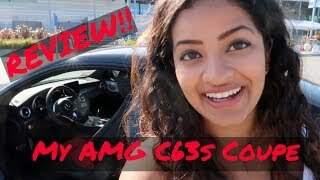 Let us have a look at the review of Mercedes-Benz C63 AMG Coupe 2017 to know in detail about it. The interior of Mercedes-Benz C63 AMG Coupe 2017 carries a design language that might recall you the C-Class Coupe it replaces. However the beauty is worth all the attention. The AMG-badged flat bottom multifunction steering wheel is placed commendably in front of the comfortable sports seats. The buyers also have an option to take the model with performance seats that have adjusting feature and increased lateral support. The custom instrument cluster carries a 12 o’clock stripe while the man-made Dinamica leather and the microfiber work over the seats make the arena worth all the money. The center stack is made from carbon-fiber while the dials feature carbon look. Talking about the technology it has the AMG Dynamic Select switch next to the touchpad while the hints of tradition come through the analogue clock and the round air-vents beneath the screen. Thus rounding up the interior details of Mercedes-Benz C63 AMG Coupe 2017 I would say though carried from past but the elegance and sportiveness is still uncompromised. 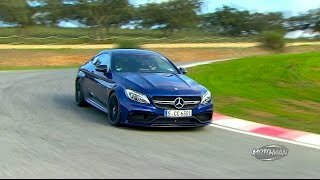 The exterior of Mercedes-Benz C63 AMG Coupe 2017 adapts the aggression and moulds it into a sleeker stance and thus we get the all new aggressive beauty. Starting with the front fascia, we have the single bar grille amidst the new set of headlights. Company this time made the A-shaped bumper with a new appearance with the spoiler beneath adds to the glory. Moving towards the rear end, things get more sportive. The sleek body at the rear gets a spoiler over its wide trunk lid while the aerodynamic diffuser fitted in the rear bumper and the pair of exhaust system on either corner complements impeccably. 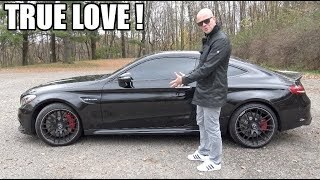 Thus rounding up the entire exterior details of Mercedes-Benz C63 AMG Coupe 2017 I would say that the wider body and the sleek stance looks gorgeous rolling over its bulky wheels. 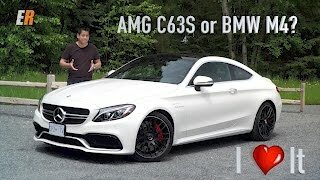 Beneath the hood of Mercedes-Benz C63 AMG Coupe 2017 are two drivetrain options; first comes with the AMG C63 S Coupe where the 4.0 liter V8 generates total output of 503 hp and peak torque of 700 nm. The second one is with AMG C63 Coupe where we have 469 hp and peak torque of 650 nm. Both the variants mate to AMG Speedshift, seven-speed automatic transmission featuring four driving modes; comfort, individual, Sport + and Race. 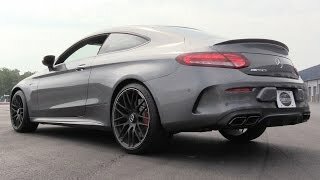 With the power rolling the fleshy wheels, top speed of Mercedes-Benz C63 AMG Coupe 2017 touches electronically limited mark of 180 mph and 155 mph respectively, while the 0-62 mph sprint can be knocked in just 3.8 seconds and 3.9 seconds respectively.